Nice clock, finally a 680i to compare. Having RAM issues, When i run ram:fsb at 1:1 i get bad boots. any suggestions? Doh...... I'm an idiot... I knew it was trying to run at 1333mhz, Just never thunk to set it at 667! Hmmm, didn't see they're OC stuff, Too much chatter between posts, so i probably glazed over. patonb: If you wish to have your overclock recorded in the Original post you will need to post your results in the format laid out, and just as well the same format everyone else followed. Yha.. I knew, I REALLY just wanted help with my RAM so i added the screen more for extra info than for the score. It's only 3.0 so it's not in the top.. and barely stressed. But thanks for the reminder...My Superpi's more impressive than my OC at 17.603. Ive been reading about overclocking well before I built my first rig. gave it my first shot this morning. All i did was change the FSB to 400 and it gave a oc to 3.6, just what I figured. I ran Prime 95 for about 2 1/5 hours afterwards and didnt get any errors at all. Im running it over night tonight. should I up the vcore at all, or if its stable just leave it? Just learning about it so Im taking it very easy, decided to leave the easytune alone and do it in BIOS. I added a link to the Hard Forum Overclocking Data base. Final Vcore is chip and cooling dependant, some people can have medium to crazy overclocks on near to slightly above stock voltage because the chip may have a low VID or is just a rare good overclocker. 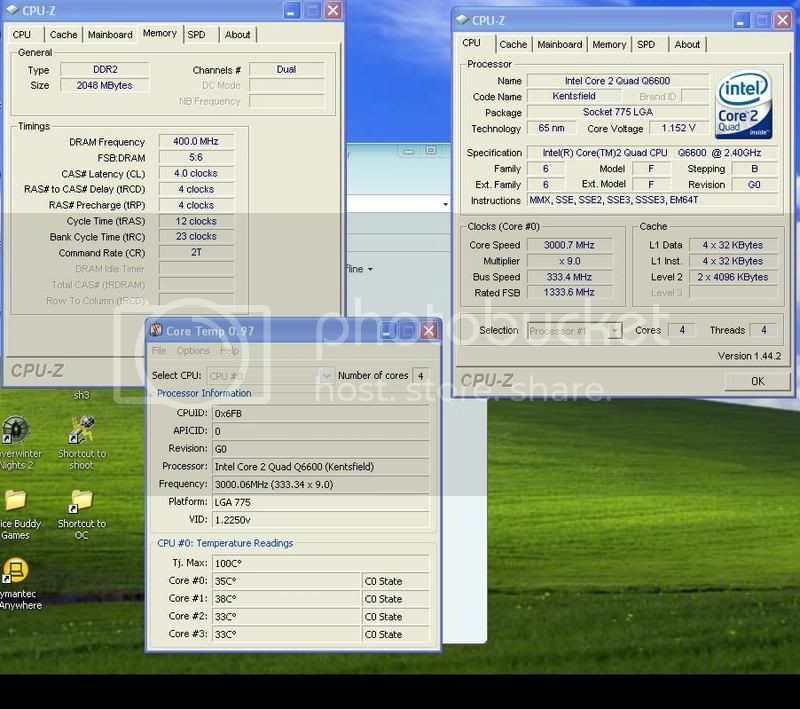 my VID is 1.25 and I only need 1.3375v for 3.6 Ghz, some chips clock better than others on lower voltages, that is all. Hey Ste, since I don't have a Core Architecture based CPU, and I want to be part of the list, what do you recommend I use?